Do you remember Maybelline Kissing Potion? It was a roll-on shiny lip gloss from the 1970's. The ad above (1975) features a young Kim Basinger. The gloss originally included the following flavors: Strawberry Swirl, Mighty Mint, Krazy Kola, Cherry Smash, Cinnamon Stick, and Fruit Flip. Later other flavors were added, like Candy Cane (pictured below). 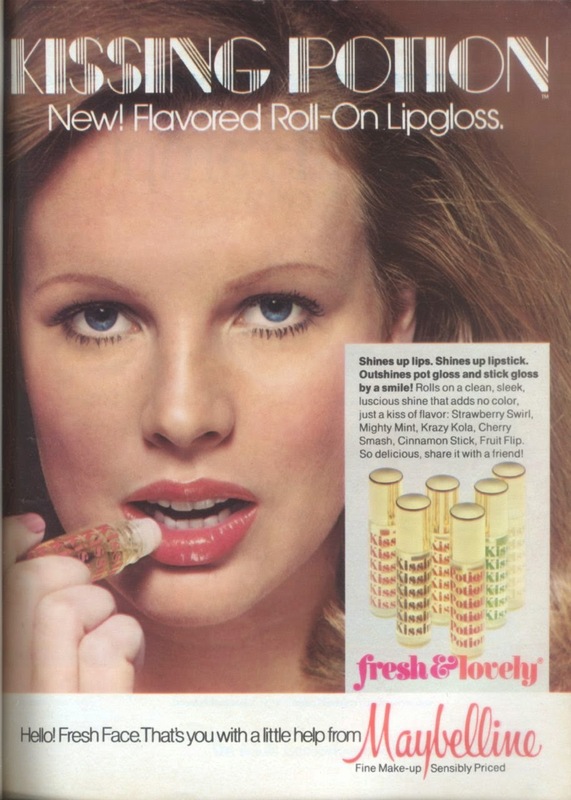 I loved this lip gloss as a 1970's teen! I recall it was sometimes a little gift in a Christmas stocking, or at birthday parties. My favorite flavors were Mighty Mint, Candy Cane, and Cinnamon Stick. It tasted sweet and it was very shiny. I used this for a long time until one time a bottle of it leaked in my purse while I was at school. That ended my love of Kissing Potion! After that I moved on to Bonne Belle Lipsmackers. If you enjoy retro topics like this, come join my 1950's - 1970's retro pop culture group on Facebook, Do You Remember (just click the link). Do you remember Kissing Potion or Lipsmackers? I remember those!!!!!! Can we please go back in time and get some. I don't remember the flavors but I can remember the feel of them and how the goo got all over the outer part when you closed it. This sounded yummy! So much fun being nostalgic and looking back. I DO, I DO remember, Trish but I'll admit I hadn't thought of Maybelline Kissing Potion in decades. I totally remember those when I was a teen in the 70's! Thanks for taking me way, way back! I need to go listen to some 70's music now! I joined your group on FB, too! I LOVED Kissing Potion! Cherry Smash was my favorite flavor. And, yes, if you ever had one leak or bust on you or in your purse, it wasn't pretty. But how fun! I remember Lipsmackers. It was sooooo shiny. I love a good gloss though. The Kissing Potion is so classic. I wouldn't have recognized Kim B.
Oh my, I wouldn't have recognized Kim B. I remember LipSmackers. It was so shiny. Alli, glad you joined our FB group. We have a lot of fun with retro chat there. I was also a 1970's preteen/teen.